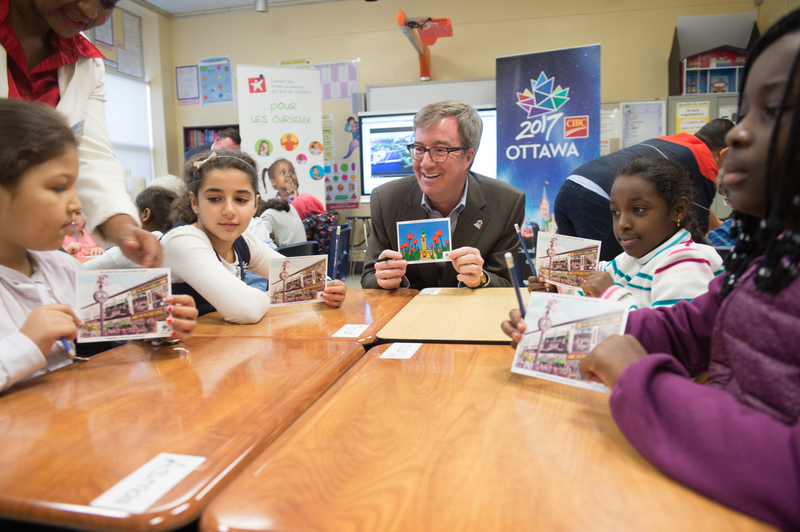 As part of a city-wide student postcard writing initiative, the Ottawa 2017 Bureau and Mayor Jim Watson, in collaboration with lead partner CIBC, are pleased to welcome Canada Post and the Canada Post Community Foundation as programming partners for Canada’s 150th anniversary celebrations in the nation’s capital. In collaboration with Ottawa 2017, Canada Post has printed and delivered more than 45,000 postcards to Ottawa’s four local school boards: the Conseil des écoles publiques de l’est de l’Ontario, the Conseil des écoles catholiques du Centre-Est, the Ottawa Carleton District School Board and the Ottawa Catholic School Board. A grant from the Canada Post Community Foundation will support mailing costs. Students from Grade 3 to 6, inclusively, will be receiving the postcards this month and, as an in-class project, they will be writing personalized messages inviting relatives and friends living elsewhere in Canada to take part in the celebrations in Ottawa next year. The postcards were designed by area students for the Ottawa 2017 Postcard Design Contest. “We’re proud to welcome Canada Post, a national corporation that’s been connecting Canadians for generations, as an Ottawa 2017 partner. This postcard initiative is a great way to engage young Canadians and build excitement for our country’s sesquicentennial celebrations,” said Mayor Jim Watson. “We are pleased to be part of this great initiative. We’re hoping to deliver these beautiful hand-written invitations from Ottawa students to Canadians right across the country,” said Susan Margles, Vice-President, Government Relations and Policy at Canada Post and a Trustee with the Canada Post Community Foundation. “The Ottawa 2017 program was developed to inspire Canadian youth and encourage them to get involved in the celebrations. With Canada Post’s valuable support, this is an additional way of engaging young citizens and inspiring them for the future,” said Guy Laflamme, Executive Director of the Ottawa 2017 Bureau.